COLLEGE PARK, MD – Alarmed by the Food and Drug Administration’s (FDA) outdated and pro-biotechnology industry policies concerning the labeling & safety of GMO foods sold in America, safe food activists will hold the largest protest to date at the FDA to demand immediate policy changes. 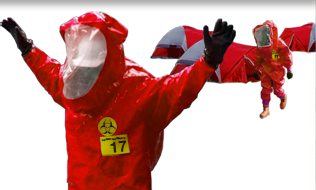 On Monday, April 8, concerned citizens traveling as far away as the Midwest will descend on the FDA for a day-long “Eat-In” outside the FDA’s Center for Food Safety and Applied Nutrition located at 5100 Paint Branch Parkway, College Park, MD 20740. Organic farmers and backyard gardeners will bring organically-grown vegetables from their region that will be combined in a huge cooking pot to make a special, GMO-free “Stone Soup” that will be eaten in protest as a picnic-style event outside of the FDA. WHO: Safe food activists, students, farmers, and concerned citizens, including Dave Murphy & Lisa Stokke, founders of Food Democracy Now!, Patty Lovera, Assistant Director of Food & Water Watch, Birke Baehr, 14-year-old Organic Farmer, members of the Organic Consumers Association, GMO Inside, and representatives from Right to Know GMO, a grassroots Coalition of States for GMO Labeling, including GMO Free DC, GMO Free VA, GMO Free MD, GMO Free PA, GMO Free CT, GMO Free NY, and GMO Free MA. Jonny Motto, chef at Taan DC will cook the soup. 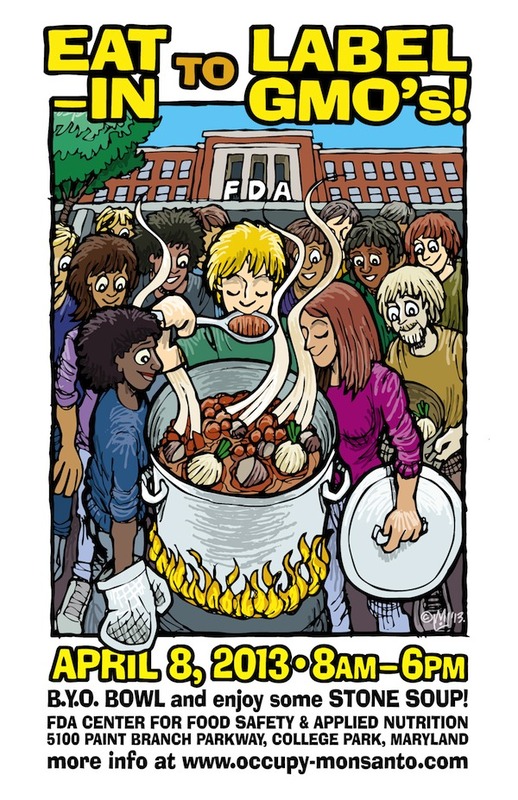 WHAT: “Eat-In” at the FDA for GMO Food Labeling and Food Democracy. WHERE: Sidewalk outside of the Food And Drug Administration’s Center for Food Safety and Applied Nutrition, 5100 Paint Branch Parkway College Park, MD 20740 – Directly across the street from the College Park Metro Station (Green Line). WHEN: All day, Monday, April 8 from 8am until 6pm – From 8am until Noon Safe Food Activists will prepare the Stone Soup and at 1pm the Stone Soup will be served to everyone with a bowl. After lunch, there will be a seed exchange and workshops on various topics. Last week Safe Food Activists formally invited FDA Commissioner Margaret Hamburg and the staff at the Center for Food Safety and Applied Nutrition to speak at 1pm while the Stone Soup is being served. In the letter, they requested the FDA explain why they’ve refused to change the official policy toward labeling of GMO foods and to explain why the transgenic Aquabounty Salmon does not merit a GMO label. 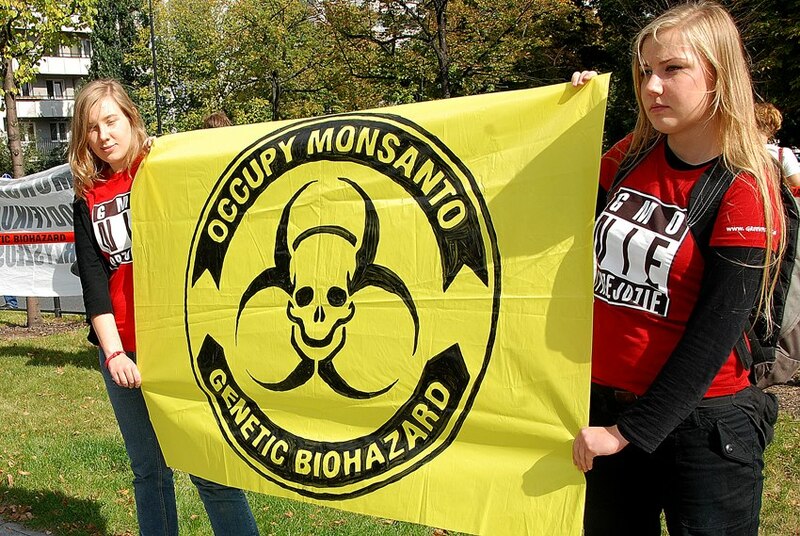 While Occupy Monsanto originally called for the demonstration, there have been numerous groups that have pledged their support for the picnic protest, including Food Democracy Now!, Food & Water Watch, Organic Consumers Association, GMO Inside, and the Right to Know GMO, a grassroots Coalition of States for GMO Labeling. There will be buses and vans from across the United States making their way to the FDA with the common goal of getting GMO foods labeled like they are in most industrialized nations. “There have been ‘Be-Ins’ and ‘Sit-Ins’ but there has never been an ‘Eat-In’ in the history of the FDA,” says Adam Eidinger, spokesman for Occupy-Monsanto.com. “Its shameful the White House has nothing to say about the multiple ‘We The People’ petitions on GMO labeling that have gone unanswered for over a year,” adds Eidinger. “The fable of ‘Stone Soup’ has been rewritten many times throughout history and will be rewritten once again on April 8,” says Tom Llewellyn, a lead organizer with the REAL Cooperative in Asheville, NC. “One version of the ‘Stone Soup’ tale is about a hungry soldier who, when passing through an impoverished village, announced that he would make ‘Stone Soup’ for everyone in town. The promise of this mysterious ‘Stone Soup’ persuaded people in the small village to pool their resources and offer up their hidden onions, carrots, lettuce, and spices to feed everyone. With all food activists and citizens working together, a greater good can be achieved by forcing changes in the way huge food corporations source ingredients and the way our government regulates food safety,” says Llewellyn. 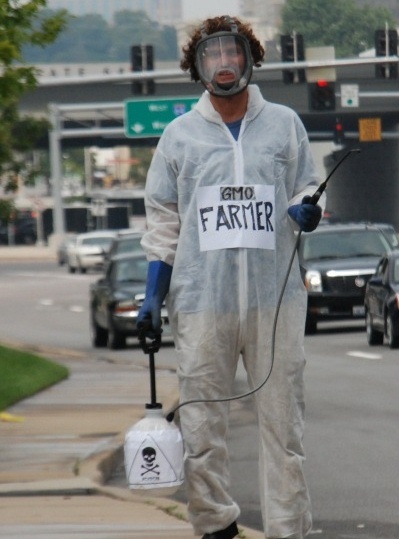 Several dozen people at GMO-Free Midwest, the St. Louis portion of Occupy Monsanto, went from picketing the industry-sponsored “Biosafety” symposium at the Millennium Hotel to Whole Foods Market (WFM) in Brentwood, Missouri. It was September 17, 2012, the one year anniversary of Occupy Wall Street. Safe food activists began a series of tactics which built on previous demonstrations and caught store management and local police completely off guard. 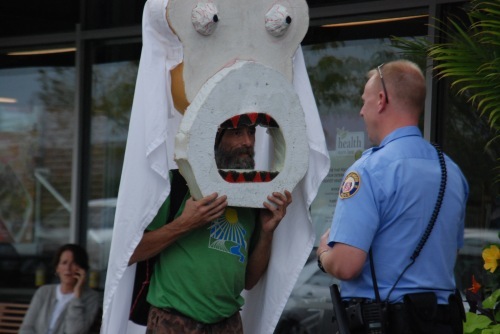 June 9 had seen a creative picket of WFM, including a 14 foot tall coyote puppet opposed to putting genetically modified organisms (GMOs) in food. The picket provided an opportunity to talk with WFM workers who have been led to believe that the store does not sell GMOs. A few shoppers joined the picket upon learning that WFM brags that it labels GMO food when it only labels non-GMO food, leaving customers uninformed about potentially contaminated products. On August 18 a new tactic challenged WFM. WFM aggressively censors “soliciting” which it says includes telling customers of dangers that GMOs poses to health and the environment. So, we went into its parking lot with signs on top of cars saying “GMOs Contaminate Food” on one side and “WFM Sells GMOs” on the other. Other cars had the same message on window signs or on home-made bumper stickers. Police told drivers that they could not enter the parking lot with “protest signs” on their cars. But they were hard pressed to explain what was and what was not a protest sign. They were particularly befuddled at trying to figure out if they should order the removal of bumper stickers, since so many cars at WFM have safe food slogans on them. As we discussed what constitutes a protest message, other drivers came in, parked, and let their cars with signs on top remain throughout the afternoon. 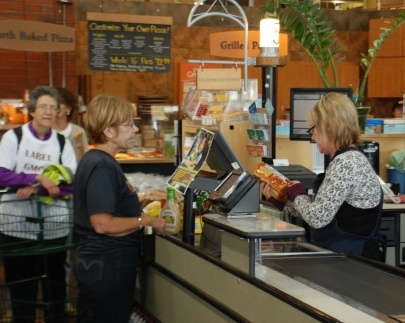 On September 17, participants from GMO-Free Midwest took activities at WFM to a higher level. A few carried signs on the sidewalk. But most walked to the front of the store. “If you are here to protest, you need to go to the sidewalk,” the police motioned. I buttoned up my jacket over my “Genetic Engineering — Don’t Swallow It” T-shirt and walked through the police. Since we didn’t appear different from the typical WFM customer, others did the same. Some said, “I just came here to pick up a few items” as they walked by the police, who were again unsure of what to do. Apparently warned that we would be there, WFM staff could be heard saying “What’s happening? They’re all coming in to shop.” Safe food activist wandered through the store looking at labels carefully. They did not put items in their carts if they read, “GMO-free,” “organic,” or “365,” which is the WFM house brand. As shoppers went through the check-out line, they picked up each item and asked the cashier if it had GMOs in it. If so, it went in the “don’t buy” pile. Cashiers often weren’t sure; and that meant it also went in the “don’t buy” pile. One cashier claimed that everything WFM sold was GMO-free, which led to each item in turn being put aside by a disbelieving shopper. 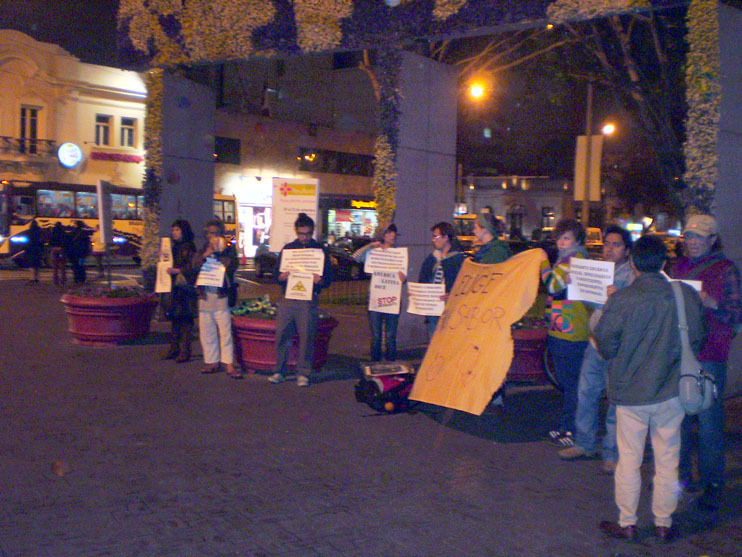 Mindful of the bad working conditions at WFM, shoppers took the opportunity to explain our concerns to every employee. And there is no better opportunity to discuss potential food contamination than doing so with a customer waiting behind you in line. WFM is particularly vulnerable to such a tactic because the vast majority of its customers are concerned about food quality, but most think that store products are GMO-free. From chatting with us, customers found out that, though WFM products cost more than those at other grocery stores, they are very likely to contain GMOs. With a bad rep for extreme anti-unionism and buying out competitors in order to destroy them, WFM is also resented for reversing its former opposition to GMO foods. It now babbles about “informed customer choices” but fails to inform customers by labeling food that might have GMOs. Many safe food shoppers asked for the manager to come and verify whether food in their cart was GMO-free. At one point, a frazzled manager began grabbing handfuls of food and pushing it aside, saying “Yes, all this food has GMOs.” The manager seemed obsessed with keeping the check-out lane flowing as rapidly as possible. Managerial distress was caused by two dictums: WFM policy says that every customer question must be answered; and, WFM also says that shopping must be a “pleasant experience.” But the shopping experience might be made unpleasant either by a slowed check-out line or by customers watching someone being hassled by police for the crime of asking if food quality is compromised. This particular manager decided that pleasant shopping would best be maintained by confirming that a large amount of WFM items might be contaminated with GMOs. The National Lawyers Guild (NLG) had told us that WFM could order us to leave and those who refused could be arrested. But it would have been impossible for WFM to determine who constituted “us.” WFM could have brought police from inside to harass those they thought were “protestors.” But doing so would run the risk of intimidating everyday customers who go to WFM concerned with the quality of food and happen to ask a question or two about what they are buying. Its liberal façade again makes WFM more vulnerable to a shop-in than any other supermarket chain. Our friendly shoppers left the store with a single purchased item, confirming that they were, in fact, WFM customers. Others asked what all the commotion was about and what we were trying to accomplish. Some asked if they should boycott WFM. We explained that they could help lay the groundwork for a future boycott by telling everyone they knew about the true face of WFM. The WFM ban on “solicitation” had been broken in store aisles, in check-out lines, and at the store entrance. Unable to distinguish “protesters” from “legitimate” customers, neither WFM management nor Brentwood police could stop people from asking “Why should we be concerned about what we buy at WFM?” Getting people to ask that question was the point of the action. A stiff foam-board sign with holes for zip-ties can be fastened with bungy cords to the top of a car in 10–15 seconds by people who have practiced doing it. 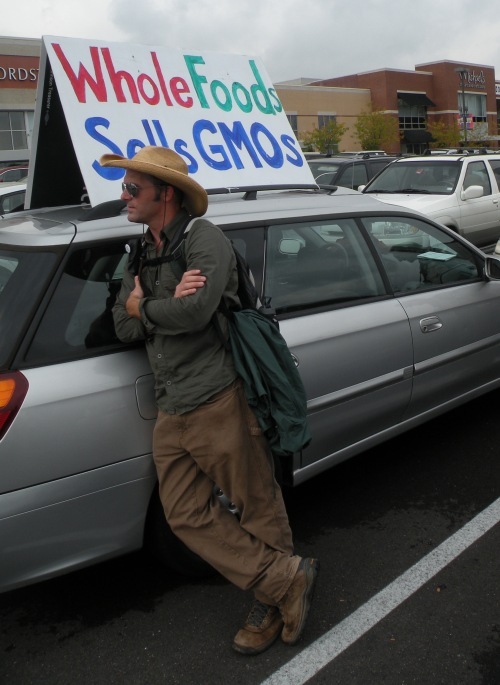 As cops and store managers were trying to figure out if they could do anything about the growing number of GMO conversations among customers, two people fastened a six foot long sign saying that “WFM Sells GMOs” atop a station wagon. By the time the cops figured out what had happened, the two were long gone. Cops walked over and asked the people looking at the car who owned it; but they just shrugged their shoulders. Most picketers left their sidewalk location to see what the cops were doing. Friendly shoppers walked toward the car. Customers drifted over to hear everyone asking about why police were concerned with a car that had a sign on its hood. There’s few things that people gawk at more than cops looking at something while a small crowd looks at the cops. Barbara Chicherio asked what bothered them. “Protest signs need to be on the sidewalk and not on cars,” a cop huffed. “Ma’am, please do not take off your T-shirt in the parking lot!” The crowd laughed and even the cop chuckled. The absurdity of trying to wrestle through the twists and turns of exactly what type of free expression WFM could suppress was too much. It had become clear that effects of the police presence had turned into their opposite. Intended to be soft-core harassers, the police were less than totally dedicated to protecting WFM customers from the horror of people asking about food contamination. As they drew a larger crowd, the show of police force served to increase discussion about WFM, thereby furthering goals of the action. Many of the tactics used on September 17 had been worked out weeks before. Others arose as the event unfolded. Throughout the WFM action, neither store management nor police had any idea of what to expect next or how they should respond. Within half an hour of the mini-confrontation in the parking lot, the police gave up efforts to get the sign off the car and walked off. Soon the crowd drifted away but the sign remained until the end of the action. Having reached over 10 times as many WFM workers and customers as all previous efforts combined, safe food shoppers boarded a bus and cars headed for their final destination of the day: Monsanto World Headquarters in Creve Coeur, Missouri. 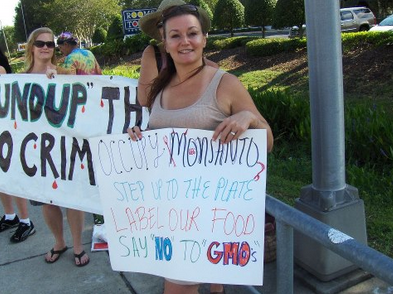 The Occupy Monsanto RTP protest in North Carolina was small in comparison to many this week, but many powerful outcomes have occurred. One woman drove three hours to attend over her concern for what toxins could be in the baked goods she sells to her customers, and others to demand that foods containing GMO’s must be labeled, but it was the children that attended who made the greatest statement of the day. 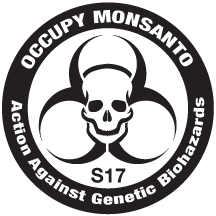 The childrens protest signs simply said “I am not a lab rat, NO GMO’s” but that’s exactly what Monsanto and their affiliates have done to them and the entire population of the world. All across America, events like the demonstration today, in Daytona Beach Florida, are taking place. What is all the excitement? It’s Proposition 37, which will be on the ballot for California voters this November. Californians are again, at the cutting edge of what could change America for the better. As the Silicon Valley pioneered computers and technology, they are pioneering this food fight against chemical companies such as Monsanto and DuPont. For the first time, in American history, GMO labeling is getting on the ballot; Finally, GMO’s are going to have their day in the court of public opinion. Proposition 37 was an initiative brought forward by voters, therefore, it cannot be removed from the ballot in California. In other cases, Monsanto has threatened lawsuits and states have backed down from this battle, however, California’s governing officials canNOT remove this initiative from the ballot based on California law. A clear victory for the Ballot Initiative Process in California. 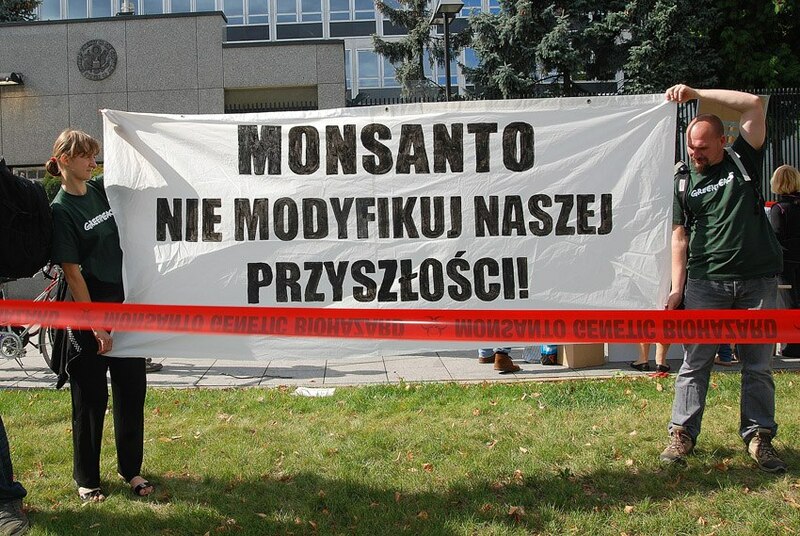 This issue has been bought, intimidated and threatened out of many courtrooms, but this time, Monsanto’s money won’t buy or bully the outcome. It is up to the voters. It is up to us. Let’s work together to help others become aware of the dangers and unknowns of GMO’s. Let’s support Proposition 37 from where we are, to encourage those fighting on the front lines, to continue fighting the good fight. I will be posting videos about our event in Daytona Beach Florida! There will be more events planned across the nation as election day nears. 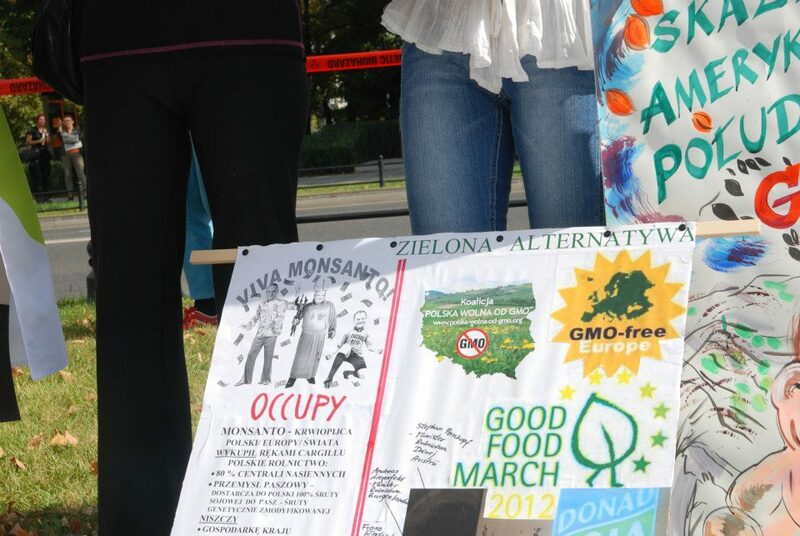 You are invited to stand with us as we stand against GMO’s. 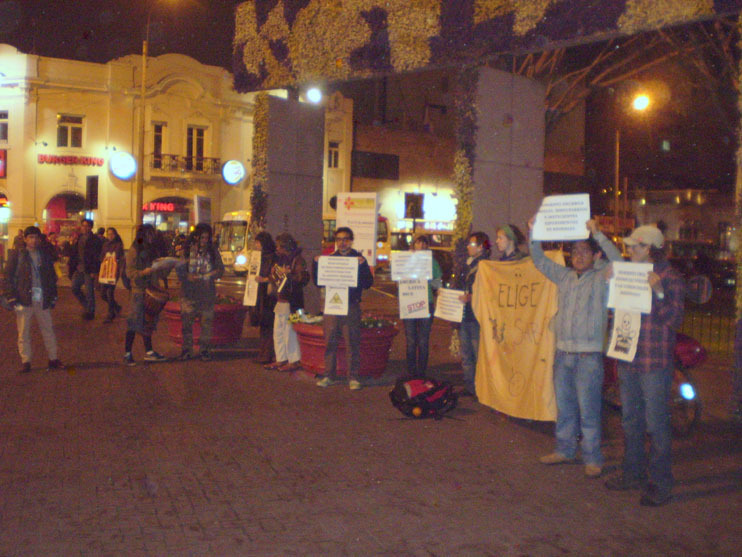 Cuestiónalo Todo and R-Evolución zine made a demonstration in Central Park of Miraflores, a comercial high-medium class district of Lima, Perú, in the context of Occupy Monsanto. 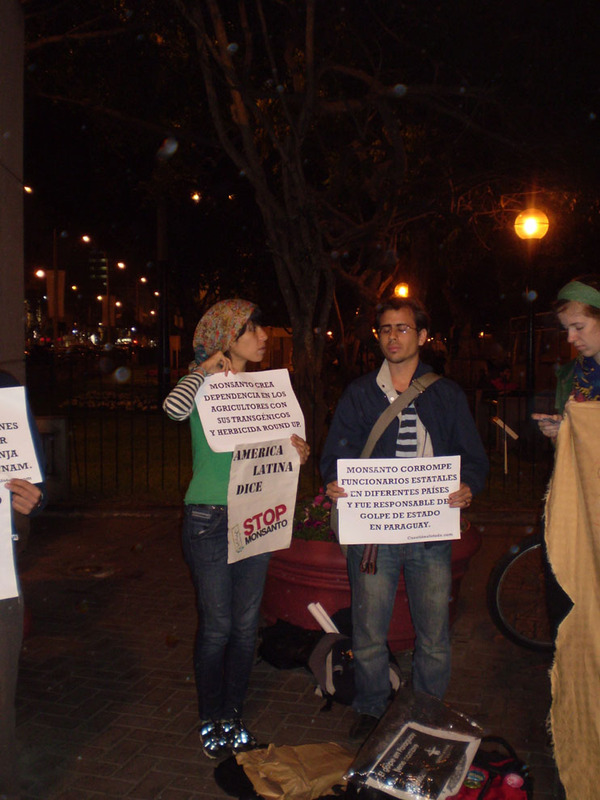 Took part of this action: some militants of Tierra y Libertad (Land and Freedom, preuvian eco-leftist party), activists of Acción Antiespecista (Antispeciesist Action) and independent activists. Cuestiónalo Todo is an activism plataform open for everyone who want to question any matter. Cuestiónalo Todo y el fanzine R-Evolución realizaron ayer el lunes 17 (entre 8:00pm y 9:45pm) una manifestación en el marco de Occupy Monsanto, como lo hicieron otras organizaciones y activistas al rededor del Mundo. Tomaron parte de esta acción además de los organizadores, algunos militantes de Tierra y Libertad, activistas de Acción Antiespecista y activistas independientes. Mañana les enviaremos fotos en la mañana. Cuestiónalo todo es una plataforma de activismo abierta a todos aquel que quiera cuestionar algún tema. PD: Un policía de la comisaría de Miraflores me pidió mis datos, incluido el DNI y tomó notas. Un amigo me dijo que eso está prohibido y pues tienes razón, no le pueden pedir documentos a alguien por difundir información. También había un policía vestido de civil haciendo muchas preguntas.